In my former life as a Dream Dinner store worker, one of the highlights for our guests during the morning session wasn’t the free scones – it was the single-serving brewed cups of coffee that they could make to kick start their day. The store had a Senseo coffee machine, and using that, then selecting from one of the four blends we had, they were able to get a freshly brewed cup of morning caffeine. When the store closed its doors, the coffee machine was gone too. A couple of things to note about the Senseo Coffee Machine itself. First, out of the box, it was really easy to set-up. I rinsed everything first (as a note, all of the removable parts are dishwasher safe.) Then I filled up the water reservoir to the fill line with cold water. Next, select the flavor coffee pod to use for my cup of coffee – we decided to go with the Kona Blend. Senseo offers 15 different blends of coffee in their specially designed coffee pods, with flavors ranging from Cappuccino to Dark Roast to Godiva Creme Brulee. Each pod contains a pre-measured serving of roasted, ground coffee and is specially sealed to ensure freshness. There are special pod holders that come with your machine that allow you to use 2 pods at once to brew two cups of coffee. 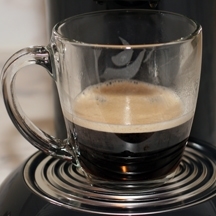 To brew the cup of coffee, you simply place the pod in the pod holder, tightly close the lid of the machine, and then hit the 1-cup or 2-cup button. At this point, all of your work is done. 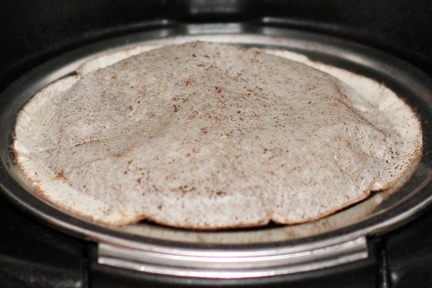 You simply need to press the button – there isn’t any need to boil water in advance, set-up coffee filters, or measure out coffee. Within 30 seconds (for one 4 ounce cup) to a minute (for two cups/8 ounces), the Senseo coffee machine will heat the water, and then begin the filtering process. The heated water passes quickly and evenly through the coffee pod and into your cup. Since everything is automated, you don’t need to worry about strength or temperature – the machine does it all for you. When the coffee comes out, you’ll notice yet another feature that truly makes the Senseo Coffee Machine and coffee pods stand out – the foam. The secret is how the coffee comes out of the machine – with a little bit of froth, making the coffee smooth and light to the last drop. 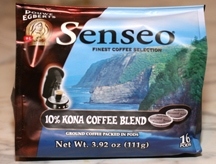 As I mentioned earlier, we got to try two of the Senseo Coffee Pod Flavors – the Senseo Breakfast Blend and the Kona Blend. The pods are available in packages of 16 or 18. The packages themselves are designed to provide a good oxygen barrier to help keep the coffee fresh. In addition, the pods are packaged in a special “protective atmosphere” to help keep the coffee aroma in the package. Both of these packaging techniques seemed to work, since the coffee tasted incredibly fresh and the smell when you open the bag was wonderfully fragrant. After enjoying one of the best cups of coffee you’ll ever taste, you’ll be glad to know that clean-up is completely painless. Since the coffee is still in its sealed pod, simply grab the pod-holder, walk to the trash, and flip the holder over, watching the pod fall neatly into the trash can. You can wash all of the removable parts by hand or in a dishwasher. Finally, for long-term maintenance, you only need to de-scale the coffee machine every 3-months, not more frequently. 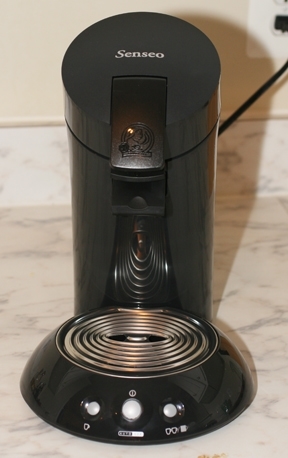 In terms of convenience, flavor, and cost, it’ll be hard to beat the Senseo Coffee Machine and Senseo Coffee Pods. 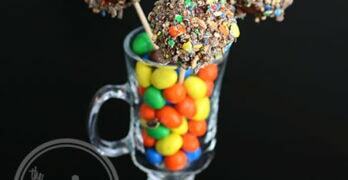 This is a great gift option for coffee lovers. If you’re a planner like myself, you’ll notice that if you first give the Senseo Coffee Machine, you can use subsequent gifting occasions to give new types of Senseo Coffee, making gift giving a breeze! Both the machine and the pods are available for purchase from retailers such as Target and Wal-Mart, and online through the Senseo Online Store or through Amazon’s Senseo Store. Disclaimer: This post consists of my (and/or fellow tester) opinions only. No compensation was given for this review/giveaway. 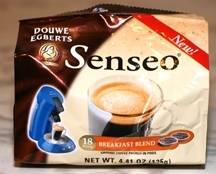 I did receive a free Senseo Coffee Machine and four bags of Senseo Cofffee Pods from the manufacturer or the representing PR agency to use and test for the purposes of this review. This did not affect the outcome of this review.